The Pinot tribe is very old and its true origins are lost in time. Pinot Noir was cultivated in the region now known as Burgundy before the arrival of the Romans and according to Carol Meredith of University California Davis, is probably only one or two generations removed from wild vines. It has been proposed by researchers in Austria that Pinot Noir is a cross between Pinot Meunier and Traminer but this is unlikely. Rather, Pinot Meunier appears to be a chimera, that is, a mutation in the epidermal (outer) cells creating two tissue layers of different genetic makeup with the inner layers genetically identical to Pinot Noir. Pinot Noir has a proclivity to mutate and both Pinot Gris and Pinot Blanc are mutations of Pinot Noir with DNA profiles that are identical to Pinot Noir. The leaves, clusters and vines of Pinot Gris and Pinot Noir are so much alike that the only thing to distinguish them is the coloration difference. Pinot Gris is a white variety of wine grape with skins that can vary in color from grayish-blue (“gris” means “gray” in French) to rose or pink or even white. The wines produced from Pinot Gris are usually varying shades of yellow but can take on shades of copper or pink. If Pinot Noir is a red grape masquerading as a white grape, as is often quoted, then the opposite would be true of Pinot Gris. Pinot Gris was known to exist from the Middle Ages in the Burgundy region and spread to other parts of Europe from there. Over time, it has been successfully propagated throughout the world where it has taken on a number of different local names and synonyms: Pinot Beurot in Burgundy and the Loire Valley, Malvoisie in the Loire Valley and Switzerland, Auxerrois Gris in Alsace, Fromentau in Languedoc, Tokay d’Alsace (now renamed Pinot Gris) in Alsace, and Pinot Grigio in Italy. In the last 20 years, Pinot Grigio has become wildly popular in the United States, probably because the name is foreign yet rolls easily off the American tongue and the Pinot Grigio style of wine from Italy is light, crisp, sometimes spritzy and easy to drink. Last year the Oregon wine industry lost David Lett, an icon who passed away after a long and distinguished career as a winegrower and winemaker in the Willamette Valley. He was affectionately referred to as “Papa Pinot,” since he was the first to plant Pinot Noir and Pinot Gris in the Willamette Valley in 1966. The story goes that Lett began marketing Pinot Gris as a perfect wine match to salmon, christening it “salmon wine,” and the popularity of the wine slowly evolved in Oregon. In Jancis Robinson’s classic book, Vines, Grapes and Wines, published in 1986, she noted that Pinot Gris” was practically ignored in the New World.” It wasn’t until the 1990s (as winemaker Scott Shull points out below) that Oregon Pinot Gris achieved notoriety. I asked four winemakers in the Willamette Valley who have had experience growing and crafting Pinot Gris to comment about how it has become Oregon’s signature white wine, how it fits into food and wine pairing and how Oregon’s version of Pinot Gris is distinct from Pinot Gris from California and Alsace, France. I have included the responses of Harry Peterson-Nedry of Chehalem, Gilles de Domingo of Cooper Mountain Vineyards, Don Lange of Lange Estate Winery and Scott Shull of Raptor Ridge. Q: How did Pinot Gris become Oregon’s signature white wine? A: Harry Peterson-Nedry: Pinot Gris has become the most widely planted Oregon white grape due to its versatility and partly by default. It is a variety that performs well in most regions of Oregon, warm to cool, retaining good acid while developing excellent fruit and complexity. It was a variety that wasn’t being grown elsewhere, so carried some Oregon ownership at the time. It also came into vogue at a time when nonserious, sweeter-styled, early wine region Rieslings were in disfavor and when Chardonnay clonal changeover 26 from lackluster clone 108 to richly appropriate Dijon clones had not yet taken place. In other words, the right grape and the right time. A: Gilles de Domingo: In the late 60s, David Lett planted the first Pinot Gris in Oregon by grafting some plants on top of Riesling. Because of the early positive responses, the varietal started to develop at a rapid pace. A: Don Lange: Pinot Gris became a signature wine for Oregon because it is matched to the climate. The success of this grape in Oregon is predicated on the perspicacity of David Lett whose original plantings contain an especially intriguing “clone” of this grape which expresses uncommon depth and complexity. A: Scott Shull: After its first New World planting in 1966 by David Lett, Pinot Gris production was well ahead of the market until the mid 1990s. In the early 1990s, it must be noted that the King Estate planted and bought vast acreage of Pinot Gris in a major thrust to bring this delightful white wine to the national market. It was the combination of Lett’s varietal selection for Oregon’s cool climate and King Estates’ bringing it to critical mass that put Oregon Pinot Gris on the national stage. Q: Some do not consider Pinot Gris a wine connoisseur’s wine. What is the appeal? A: Harry Peterson-Nedry: Some wine connoisseurs DO consider Pinot Gris a connoisseur’s wine. However, it definitely isn’t Riesling or Chardonnay in stature. It has thrived in a climate in the United States where ABC (anything but Chardonnay) gained traction and where food wines were valued more (that is, fruit, more acid, less oak). A: Gilles de Domingo: In Europe, a few Pinot Gris producers have been successful in making full bodied wines with lasting length and complexity. Pinot Gris is genetically very similar to Pinot Noir. This is a wine that needs to be treated similar to Pinot Noir in winemaking practice (except the barrels). Pinot Gris with natural higher acidity will bring a level of complexity fairly unique if the vineyard and winemaking are appropriate. In a certain sense, because of the similarity to Pinot Noir, a very high end Pinot Gris requires considerable time and patience to be made. Soils and climate need to be perfect to achieve this result. Also, Pinot Gris is a varietal that can age very well and for quite a long time. If a varietal is able to be complex, full bodied and age, then it is a varietal that should be considered “Noble.” Unfortunately, the public and even wine connoisseurs tend to see Pinot Gris as a simple varietal because many examples are made in an industrial way and not as a “Noble” varietal with all the beauty and effort of winemaking. A: Don Lange: I’m flummoxed by this question. What, pray tell, is a “wine connoisseur’s wine?” If we assume that, for instance, California Chardonnay is such, then it is safe to assume that Oregon Pinot Gris is as well. When well tended, it exhibits layers of complexity, texture and balance. If overcropped and/or planted in an inappropriate climate it can produce an innocuous but quaffable white wine which is, perhaps, unfit for the connoisseur’s palate. A: Scott Shull: Oregon Pinot Gris is a gateway wine - it is just darn easy going and a great dinner guest. Often it transitions people away from heavy, oaky, white wines toward something with layers of complex citrus fruits, acidity and minerality. I think the appeal of Oregon Pinot Gris is that it complements food rather than competes with it. The style is usually stainless steel fermented and without any malolactic fermentation so the wines remain crisp and articulate, but with a touch of residual sugar that keeps things full and with an accounting of its fruit. Unlike Pinot Grigio, Oregon Pinot Gris has some heft, depth and mineral. Q: How does Pinot Gris fit into the food-wine pairing picture or is it mainly an aperitif? A: Harry Peterson-Nedry: Pinot Gris definitely fills a dinner table rather than an aperitif role. It may indeed be, after Riesling, the most food friendly wine I know, matching with traditional foods such as pork, white meats generally, sausage, rich fish and shellfish, as well as providing a wine for ethnic and spicy cuisine. I consider it a universal food wine, especially in high acid versions. A: Gilles de Domingo: If the Pinot Gris comes from Alsace and even Oregon, I will advise that it be served with nicely made salami. Also Pinot Gris with lamb is terrific. I would also recommend a Pinot Gris from a warmer climate to be served with “light” fish. 27 : Don Lange: Pinot Gris is as versatile with food as is it’s parent Pinot Noir. The classic pairing in the Northwest is with salmon. If in doubt what to serve with dinner, the baseline is to set the table with a glass for Pinot Noir and glass for Pinot Gris. Pinot Gris is its best can suggest orange, lime, ginger, anise with a fetchingly unctuous palate presence. A: Scott Shull: Oregon Pinot Gris is a great food complement with salmon (I particularly like Copper River salmon with Oregon Pinot Gris), or shellfish in cream sauce. If the acid-residual sugar balance is right, those ‘bright’ offerings of Oregon Pinot Gris are fantastic to cool the heat of Indian fare. We love a tandoori with Oregon Pinot Gris. Q: How does Oregon Pinot Gris compare with its California and Alsatian counterparts. What makes it distinctive? A: Harry Peterson-Nedry: Oregon Pinot Gris to my palate is all about freshness of fruit and acid, with pear, apple and kiwi fruit, white blossoms and light baking spices. It carries weight, but not too much, has structure for food, but not too much. Alsace seems to carry more residual sugar and is typically richer with weightier flavors, less on the white side and more on the yellow flavor spectrum. California seems to resemble Oregon in very cool areas like the Anderson Valley and seems flat and Chardonnay-mimicking from other regions. A: Gilles de Domingo: Alsatian Pinot Gris tends to be full bodied and creamy with high levels of complexity. Alsatian Pinot Gris will have “tertiary” aromas because of the high level of esterification. A general description of the aromatic profile of Alsatian and Oregonian Pinot Gris would be described as melon, pears, grapefruit, herbal and flowery. California Pinot Gris is more fruit forward with an intense aromatic profile which is monochromatic. Peach and apricot seem to be descriptive of California Pinot Gris. Because of the DNA composition of Pinot Gris, the varietal requires specific micro and meso terroir such as cool nights, long and lasting period of maturity on the vines without the effect of dehydration. Some California areas have a natural aptitude to grow wonderful Pinot Gris. Northern Oregon tends to be a later ripening season than California and the Pinot Gris as a result tends to have more acid and more aging potential than California versions. Also, Pinot Gris likes acidic soils (pH<6.5). A: Don Lange: New World Pinot Gris originated in Oregon as a result of Lett’s singular dedication to matching the varietal to the climate. Lange Estate was the fourth producer of Pinot Gris in the New World with the first release in 1987. For a period during the 1990s, Lange Estate Winery was the largest producer of Pinot Gris in North America. I do not know of any commercially grown or produced Pinot Gris at the time in California. (Note: According to A Companion to California Wine written by Charles Sullivan, a few acres of Pinot Gris were planted in California in the early 1980s and by 1995 there were 68 acres, more than half in Santa Barbara and Napa counties.) I do know, however, that when winemaker Ken Brown visited us in the early 1990s, he was not familiar with Pinot Gris but became excited about it and soon after planted Pinot Gris in California. Oregon Pinot Gris is distinguished from its California counterparts by its superior acid backbone and focus. Compared to its Alsatian counterparts, Oregon Pinot Gris is more fruit driven. A: Scott Shull: Alsatian Pinot Gris tends to be fatter with more residual sugar and often interesting “funk” from fermentation in decades old foudres. I love that smell of Alsace that you get from the first whiff of an Alsatian Pinot Gris. Oregon Pinot Gris tends to have one foot in the realm of Alsace with a touch of palate weight, and certainly shares that love of balance between residual sugar and acidity. 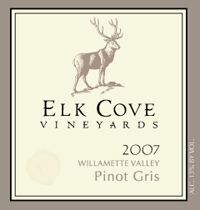 Oregon Pinot Gris is not often perceived as sweet, as many Alsatian versions can be, yet may have residual sugar levels of 0.6% to 1.0% and acidity to match and balance out. Oregon Pinot Gris has an accounting of fresh fruit, yet has length and finish driven by acidity. California Pinot Gris, often marketed as Pinot Grigio, is crisp, clear and clean. David Lett used to talk about Pinot Gris grown on the valley floor at 8 tons per acre versus what we do in Oregon, where most vineyards are on high southern facing slopes, cropped at 2.5 to 3 tons per acre. You get fruit, fat and finesse. *Oregon Pinot Gris, like Pinot Noir to which it is genetically similar, is a versatile food wine. Think of it as Pinot Noir’s natural partner at the dining table. *The aroma and flavor profile of Oregon Pinot Gris includes honey, pear, apple, mango, kiwi, citrus, spring flowers including honeysuckle and light baking spices. *A small amount of residual sugar in Oregon Pinot Gris is not unusual. It balances the acidity nicely and is frequently not detectable. *Oregon Pinot Gris wines are fresh with bright acid and although usually consumed shortly after release, some versions are capable of aging. *Oregon Pinot Gris has more fruit, weight, structure and complexity than most Italian Pinot Grigio. *Oregon Pinot Gris is inexpensive with the best examples under $20. Many are closed with screw caps and some are bottled in tall Alsatian-style bottles. *The ideal serving temperature is 50-55º F. At this temperature the wine will have more aroma, brighter acidity, a richer flavor and mouthfeel. In restaurants, Pinot Gris is often presented much too cold. If this is the case, ask the wait staff to put your glass of Pinot Gris in the microwave for 10 seconds. Forget the ice bucket unless the wine is room temperature and needs to be cooled. *If you drink no Gris, you Pinot Gris. 13.0% alc., 18,420 cases, $19. From vines that are 7-22 years of age cropped at 3.2 tons per acre (shoot and crop thinned for low yields). Whole cluster pressed and fermented at very cool temperatures in small stainless steel tanks. · Complex aromatic profile of pears, biscuit, honey and wax. Bright pear and apple fruits with a creamy richness, lively yet well-integrated acidity and a persistent finish. This is the one to try if you want to experience what Oregon Pinot gris is all about. 13.8% alc., 5,684 cases, $18, screw cap. Estate grown. · Delicate aromas of pear, melon and citrus echoed in the flavors. Perfect balance of richness and acidity with a lingering aromatic finish. 13.8% alc., 1,780 cases, $16. Sourced from 11 acres of estate dry farmed Pinot gris. · Slightly deeper yellow color than many examples. Shy aromas of pear and minerals. A bit atypical in flavor profile featuring roasted nuts, miso and honey. Very smoothly textured. 12.4% alc., $17. · Delicate and attractive scents of pears and honeysuckle. Bold pear flavor on the attack with hints of apple and citrus. Creamy with a tangy finish that features fine persistence. 15.5% alc., $19. Alsatian bottle, screw cap. 0.6% residual sugar. · Scents of pear, honey, and fermenting white grapes. Brioche, melon and citrus on the full palate with a faint hint of sweetness. A distinct rich style in the Alsatian mold. 13.6% alc., screw cap. Tall Alsatian bottle. From four vineyards (Carabella, Croft, Mahona and Murto) cropped to 2 tons per acre. Fermented with five different yeasts in 50% stainless steel and 50% neutral oak. · Rather intense aromas of pear, baking spices and almonds. Light and delicate flavors of pears and honey with a creamy mouth feel and some length to the finish. 13.0% alc., 90,000 cases, $17. The winery also produces a higher end Pinot gris from 100% organically grown Estate fruit under the Domaine designation ($25). · Classic with white flower and honey aromas and flavors of pear, banana and melon. Appealing richness with a good grip on the finish. 13.3% alc., 8,200 cases, $17, screw cap. · Faint yellow- color. Tropical fruits and grass with a hint of petrol. Demure fruit with racy acidity, a hint of spritz and a dry finish. 13.0% alc., 30,500 cases, $12, screw cap. · Very shy aromas of tropical fruit including guava. Light and delicate expanding somewhat with time in the glass but still is rather dilute. The above wines represent only a small sampling of the large number of offerings of Pinot Gris from Oregon wineries. Practically every major producer of Pinot Noir in Oregon releases a Pinot Gris and they are usually available directly from the winery websites. Note: In 2009 I sampled two more Oregon Pinot Gris wines worthy of mention. Go to the winery's description and tasting notes for a review of these two wines: 2007 Lange Estate Winery & Vineyards Willamette Valley Pinot Gris and 2006 St. Innocent Vitae Springs Vineyard Willamette Valley Pinot Gris. The St. Innocent bottling is particularly stunning.